Production: Citel Films and SSR Télévision Suisse (Geneva), Action Films and Société Français de Production (Paris); Eastmancolor, 35mm; running time: 110 minutes, some sources list 116 minutes; length: 10,401 feet. Released 25 August 1976. Producers: Yves Gasser and Yves Peyrot; executive producer: Roland Jouby; screenplay: John Berger and Alain Tanner; photography: Renato Berta; editors: Brigitte Sousselier and Marc Blavet; sound recordist: Pierre Gamet; sound re-recordist: Christian Londe; music: Jean-Marie Senia. Cast: Jean-Luc Bideau ( Max Sitigny ); Myriam Boyer ( Mathilde Vernier ); Myriam Mzière ( Madeleine ); Rufus ( Mathieu Vernier ); Roger Jendly ( Marcel Certoux ); Jacques Denis ( Marco Perly ); Miou-Miou ( Marie ); Raymond Bussieres ( Charles ); Dominique Labourier ( Marguerite ); Jonah ( Himself ). Berger, John, and Alain Tanner, Jonah qui aura 25 ans en l'an 2000 , Lausanne, 1978; as Jonah Who Will Be 25 in the Year 2000 , Berkeley, 1983. Leach, Jim, A Possible Cinema: The Films of Alain Tanner , Metuchen, New Jersey, 1984. Dimitriu, Christian, Alain Tanner , Paris, 1985. Detassis, Piera, Alain Tanner , Firenze, 1987. Jaeggi, B., in Cinema (Zurich), no. 3, 1976. Variety (New York), 25 August 1976. Kael, Pauline, in New Yorker , 18 October 1976. Colpart, C., in Revue du Cinéma (Paris), November 1976. Image et Son (Paris), November 1976. Haskell, Molly, in Village Voice (New York), 1 November 1976. Le Pavec, J. P., in Cinéma (Paris), December 1976. Rubenstein, L., "Keeping Hope for Radical Change Alive," in Cineaste (New York), Winter 1976–77. Stam, Robert, " Jonah Who Will Be 25 in the Year 2000 : The Subversive Charm of Alain Tanner," in Jump Cut (Chicago), no. 15, 1977. Greene, L., " Jonah : Subversive Charm Indeed!," in Jump Cut (Chicago), no. 15, 1977. Daney, Serge, "Les Huit 'Inside Ma,"' in Cahiers du Cinéma (Paris), January-February 1977. Heinic, N., in Cahiers du Cinéma (Paris), January-February 1977. Tarantino, M., in Take One (Montreal), March 1977. Gitlin, T., in Film Quarterly (Berkeley), Spring 1977. Brossard, J. P., "Dialektisches Spiel mit den Ausdrucksformen," in Film und Fernsehen (Berlin), December 1977. Dawson, Jan, in Monthly Film Bulletin (London), January 1978. Listener (London), 23 February 1978. Pulleine, Tim, in Sight and Sound (London), Spring 1978. 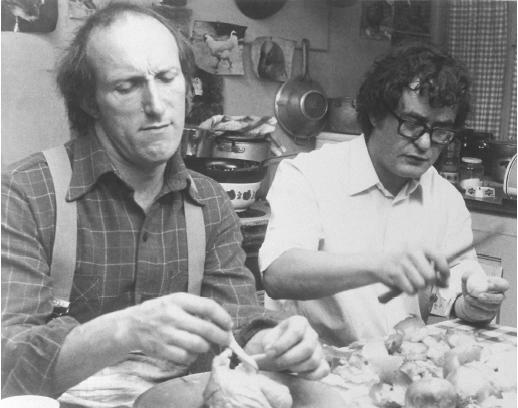 Tanner, Alain, in Ecran (Paris), 15 January 1979. Monthly Film Bulletin (London), July 1979. Harrild, A. E., in Film Directions (Belfast), no. 11, 1980. Prono, F., in Cinema Nuovo (Bari), February 1980. Horton, A., "Alain Tanner's Jonah : Echoes of Renoir's M. Lange ," in Film Criticism (Edinboro, Pennsylvania), Spring 1980. Toubiana, Serge, " 20 ans, Jonasp, " in Cahiers du Cinéma (Paris), no. 320, February 1981. Tarantino, M., "Going inside with Tanner," in Movietone News (Seattle), March 1981. Cinema Journal (Evanston, Illinois), Spring 1985. Short review, in Listener , vol. 118, no. 3025, 20 August 1987. Andrew, D., "Revolution and the Ordinary: Renoir's La Marseillaise ," in Yale Journal of Criticism , vol. 4, no. 1, 1990. Andrew, D., "L'identite a jamais perdue du cinema francais," in CinémAction (Conde-sur-Noireau, France), no. 66, February 1993. Jonah Who Will Be 25 in the Year 2000 is both a succinct commentary on the disillusionment experienced by the "generation of 1968" and a utopian series of vignettes that looks forward to a more egalitarian future. Jonah is Tanner's most successful collaboration with his frequent scenarist, the Marxist art critic John Berger, and this film follows the great promise shown by the two earlier Berger-Tanner collaborations, La salamandre and The Middle of the World . All of Tanner's films can be viewed as critiques of the intellectual aridity of Swiss society, and Jonah is his buoyant rejoinder to the complacency of the Swiss bourgeoisie. Jonah celebrates the communitarian idealism of eight disparate individuals at a moment of alleged historical "stasis." Yet the vitality of Tanner's protagonists helps to vitiate standard Time magazine clichés concerning the essentially "ephemeral" radical politics of the 1960s. For example, Max (all of the protagonists' names begin with prefix "Ma"), the disillusioned ex-Trotskyist, and his mystically inclined girlfriend, Madeleine, would seem to represent antithetical extremes of the counter-cultural spectrum. Yet Tanner's qualified optimism enables the politicized (if temporarily sidetracked) Max and the occultish Madeleine to share the same universe of discourse. and critical potential that is always latent (but rarely appropriated) in the educational process is highlighted in one of the film's most brilliant sequences. Marco, a charmingly gauche high school teacher, demonstrates how the hallowed "truths" of history tend to dissolve when compared to the indisputably tangible, material folds of a sausage link. Subsequently, Marco teaches his class the harsh realities of economic hardship by having his girlfriend lecture on the daily annoyances of her job as a supermarket cashier. This synthesis of the personal and political is (surprisingly) never cloying, and always reiterates with pointed humor Tanner's desire for social transformation. Jonah is ultimately one of the most astonishing examples of "Brechtian cinema" to have been engendered by the ongoing reexamination of the late playwright's theoretical corpus. Unlike many other contemporary directors, Tanner realizes that "Brechtian" does not necessarily connote humorless diatribes in the manner of "the master's" most sterile, didactic works. (The dreadful The Measures Taken comes to mind in this context.) Miou-Miou's spontaneous cabaret song, on the other hand, suggests the exuberance of Brecht and Weill, and Tanner's playful, and always unobtrusive, use of quotations from such contemporary savants as Pablo Neruda, Jean Piaget, and Walter Benjamin helps to make Jonah a particularly exhilarating example of 1970s Lehrstücke .